Back in Madrid, on recreation I thought. But things have changed in a few months, and I was sucked back into a little action. I went by Traficante des Sueños and ran immediately into Pablo, outside talking on his cel. 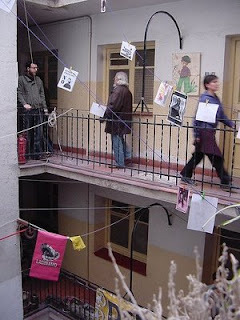 He directed me to a talk at El Patio Maravillas, the Madrid social center, that very evening. This rundown place in February had some encouraging bustle and a seedy looking bar. Now the place is plastered with a galaxy of posters and paintings, and humming with activity. They organized a "jornadas," or conference at the Reina Sofia art museum in February on the role of social centers in an increasingly provatized culture. I found this out from Dani, a filmmaker from Frankfurt I interviewed who is living in a squat in the Madrid suburb of Tetuan. Although he was involved in the first group at Patio, he is ambivalent about what he sees as the new bid for legitimacy. Surely, I suggested, something as vibrant as Patio is good for Madrid? It seemed there one could make a very long video of authority figures asking you to leave an ostensibly public space you had wandered into to get out of the sun. Unfortunately El Patio is only open during the evening. During one evening I attended a session I assume of the permanent working group on precarity. The speaker was Zoe Romano of Serpica Naro in Milan. (As the talk was in Italian, with a translation into Spanish, I faded quickly.) Serpica Naro is an anagram of San Precario, the fictitious saint of the precarious worker which has been carried in hilarious procession in numerous demonstrations. Ms. Romano showed some of the projects the group has done. The presentation is part of a series of meetings, including a workshop, on questions around precarity and the commercialization of cultural institutions. Very interesting, dense, and too demanding for a vacationing burnout case. Still, I later met and interviewed Dani with my camera, and he interviewed me. I will show the tape in Queens, at the University of Trash. Dani is involved with the Cinesinautor group (cinema without authors, which meets at Patio), and spoke of his group's encouraging meetings with people in Tetuan in their project to make a movie portrait of the district. He was surprised that the people who attended were not conventional in their ideas of what the movie might be. They were thinking like Dziga Vertov, Dani said, encouraging experimentation and imagism rather than narrative and coherence. While I envy Madrid its social center scene, everything looks more glamorous from far off. Dani complained of a strain of intolerance between social centers, antagonisms that were working against network. Dani is a fan of the writings published in Tiqqun, a French group I did not know. Very heady stuff it is, and looks to me at first glance like an egghead Crimethinc. It's clear at the least that the scene in Madrid continues to cook hard. The social centers are clearly essential laboratories of collective forms, the only places perhaps from which one might imagine an integrated (i.e., non-academic) egalitarian future culture emerging, able to withstand the "desert" conditions outside of capitalism.